Captain Molly was born Margaret Cochran on 12 November 1751 on the western Pennsylvania frontier to Irish immigrant Robert Cochran and his wife Sarah. When Margaret was five, her father was killed in an Indian raid and her mother was kidnapped. Margaret and her brother escaped and went to live with their uncle. At 21, she married a local farmer, John Corbin. When America’s Revolution began, John enlisted in the regiment that General ‘Light Horse’ Harry Lee called the Line of Ireland. Margaret accompanied him, joining other women in cooking, washing and caring for the wounded. Her forceful personality earned her the nickname ‘Captain Molly’ from the other women. On 16 November 1776, while at Fort Washington, NY, the British attacked and John Corbin, on a cannon crew, was killed. 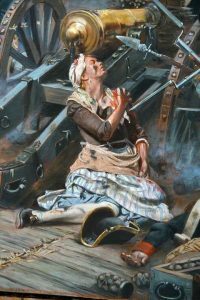 Margaret sprang to action and began loading and firing the cannon herself. She fell wounded by grapeshot which tore her shoulder, mangled her chest and lacerated her jaw. After the Brits captured the fort, the wounded were ferried to Fort Lee and transported in a jolting wagon to Philadelphia. Margaret never fully recovered from her wounds and lost the use of her left arm. With no way to earn a living and always in need of special care, in June 1776, the Commonwealth of Pennsylvania gave her $30.00 in recognition of her bravery. It didn’t last long! Margaret didn’t get along with other women whose Victorian values clashed with her blunt frontier personality. They called her ‘an unsophisticated hard-drinking veteran’ who spent most of her time smoking her pipe with soldiers at the post. However, in 1779 she received unprecedented aid as the Congressional Board of War granted her half the monthly pay of a soldier and an annual clothing allowance; she was even given a rum ration. Margaret Corbin became the first woman to receive a U.S. military pension. At war’s end, she was transferred to the Corps of Invalids for wounded soldiers at West Point in 1781. There she helped with cooking and laundry. In Major Boynton’s History of West Point, she is described as ‘usually appearing with an artilleryman’s coat over her skit. She was brusque, coarse, red-haired, wholly wanting in feminine charms and one of her biographers recorded that she made use of swear words!’ She died in Highland Falls, NY in January 1800. In an age of Victorian values the smokin’, drinkin’ and cussin’ heroine of the Revolution was not the image of an American lady held by the elite, so she was buried without ceremony. Today, three memorials celebrate her memory. 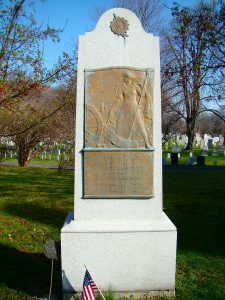 In Fort Tryon Park, Manhattan at the Fort Washington battle site, a tablet, erected in 1909, remembers her as “the first woman to take a soldier’s part in the War for Liberty“; the park entrance is Margaret Corbin Circle, and a large mural depicting the battle is in the lobby of nearby 720 Fort Washington Avenue. In 1926, the Golden Anniversary of the Revolution prompted a search for her grave and the body was re-buried with full military honors in West Point and a Margaret Corbin Memorial erected. She is the only Revolutionary War veteran so honored. In 2017, a study of remains was made after her grave was accidentally opened by excavators digging near her monument. Tests showed that the remains were likely those of a middle-aged man who lived in Colonial time. Her resting place is still unknown, but her deeds are not. Today, memorials still provide a tribute to a young Irish-American girl, born on the frontier, who grew to become America’s first female wounded warrior.